What made you decide to write You Against Me? I was contracted to write a second book for my publisher, but actually knew very little when I started writing. I had a few ideas, but they were abstract, theoretical, as if I knew the tone of the piece, but nothing else. I always use free writing techniques when I start a new project. This is a bit like improvising in theatre – throwing words down and not planning anything in advance. Most of it goes in the bin, but the strongest themes and voices keep returning. After months of this, I began to know more. I was haunted by a small seaside town, by a girl called Karyn who alleged something terrible had happened to her and by her brother, Mikey who was out for revenge. What kind of research did you need to do for the book? I interviewed criminal lawyers, social workers, family support workers and police officers. I watched court cases and read lots of books. The research really grounded the novel, but it slowed me down a lot too. All the people I needed to talk to were busy professionals, some of whom charge a fortune for ten minutes of their time and I was asking if they would talk to me for hours for free! I Love how you tell the story from both Ellie and Mikey’s point of view. What made you decide to do this and was one easier to write for than the other? I initially started writing the book in Karyn’s voice. But she was unreliable, often unwilling and mostly silent! I knew she’d been assaulted after a party, but she wouldn’t tell me the details. Instead, she introduced me to her older brother, Mikey. Then she sat on the sofa, covered herself with a duvet and refused to tell me anything else. Mikey took over the narrative. In fact he ran with it. He was determined to avenge his sister and all I had to do was follow him. I loved writing as him, because he was a mass of contradictions – he’d left school with limited prospects, yet was hugely ambitious. The main carer for his family, he also managed to juggle a complicated love life. Bright, but often inarticulate, he had an innate distrust of authority, yet his family were dependent on police and social workers for support. So, imagine my surprise when about a year into the project, a second voice appeared! Ellie was sixteen and recently moved into the area. It was her brother who was being accused of assaulting Karyn, and Ellie certainly seemed to know a lot more than she was saying about what had happened. Now that I had two voices, a more complex narrative began to emerge - a story about truth, about looking at someone you know really well and wondering what they’re hiding. It also became a love story. A bit Romeo and Julietish - loving someone forbidden. A bit Hamlet - something rotten in your own family. Do you have a favourite scene in the book you can share? My favourite scene to write was the one at the river where Ellie dares Mikey to swim. The final version is almost the same as the first draft, which rarely happens to me, but it just seemed to flow off of the page. The scene I am most proud of is the one where Ellie goes to the police station, because it was difficult to research and almost impossible to write. I wanted to show what really happened to Karyn without being titillating in any way. I wanted the reader to sympathise with Ellie, despite the circumstances she describes. I wanted it to be legally accurate and also page turning and I wanted to encourage the reader to sit in Ellie’s position and ask themselves what they might have done differently. 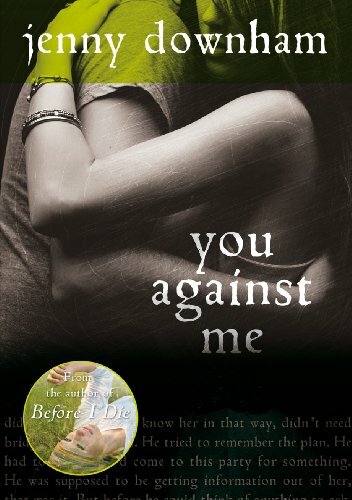 Both Before I Die and You Against Me deal with very emotional and powerful issues. What was the most challenging part of writing them? The common advice to writers is to write what you know – but I knew nothing about terminal cancer or about sexual assault and so, for me, it was the research that was the greatest challenge. After that, it was owning the material – feeling as if I had the ‘right’ to tell these stories. 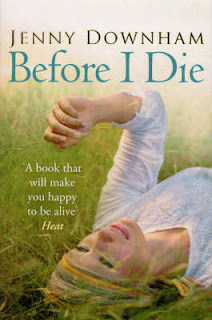 The final scenes were hard to write in Before I Die, because it’s a first person present tense narrative and Tessa is narrating her own death. With You Against Me, I wanted every characters’ actions to be motivated, so that readers would be able to put themselves in anyone’s shoes and find something to relate to. I didn’t want any character to be wholly bad or impossible to understand. I wanted the readers’ loyalties to shift. That was very challenging. Favourite books, Mmm… As a young reader I devoured poetry, folk and fairy tales (Grimm, Andersen), and stories from the Arabian Nights and Ancient Greece. I loved Ann Holm (I Am David) and Robert C.O’Brien (Z for Zachariah) – my first realisation that I could be utterly transported by words on a page. I had a fantastic teacher at secondary school who used to hand me books in the corridor – D.H.Lawrence, Gunter Grass, Jane Austen. He introduced me to poets – Dylan Thomas, John Donne, Keats, R.S.Thomas, Auden. He also spoke to the librarian and I was allowed to take out books that were clearly marked as being for older children. On my first visit, I chose Harper Lee’s ‘To Kill a Mockingbird’ and D.H.Lawrence’s ‘The Rainbow,’ both of which have a very special place in my heart. I always wrote even as a very young child, so I guess you could say that these early books inspired me. The only ‘must-haves’ are my kitchen timer and hot strong coffee. I set the timer for ten/twenty minutes and write. I do this over and over again to generate material. All the while swigging the coffee! Eventually (after weeks), I put it in scene order (chopping bad stuff) and edit with a machete until it’s a tenth of itself. I write the whole foundation of a novel like this. It’s great for when you think you have nothing, because you can get some wonderful phrases and some surprising characters and action. Loads of rubbish too. But ultimately you will familiarise yourself with your own story, see possibilities, get insights, resonances. When this is done, I move to stage two which is about revision/crafting. What’s next for you? Are you working on something new? I’ve started free writing book three, but have no idea where it will take me. Inspiration comes from everywhere. I watch the world for stories in a very energised way - newspapers, overheard conversations, etc, anything can be used. I don’t like knowing in advance. I never plan a structure. I like surprises. I’m quite disciplined and sit at my desk every day and just write. Thanks Jenny! I love that Mikey took over the narrative! And I loved that river scene too - it's one of my favourite scenes in the book!